Waking up early in the morning in a small house with a tiled roof with no alarms, just birdsong acting as one, sitting down for a healthy breakfast cooked with ingredients from the garden, spending the day walking in a jungle or swimming in a river, looking at birds and butterflies, warming oneself by a bonfire at night and calling an end to the wonderful day with a dinner by candlelight – doesn’t that sound idyllic and hardly possible? Yet that is just what we did this weekend, taking advantage of the holiday on account of Republic Day. 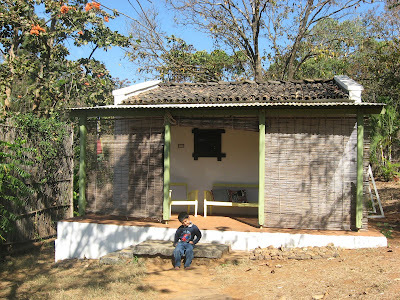 We spent three wonderful days at The Hermitage, an hour and a half away from Belgaum. Our hosts, David and Morvarid Fernandez have lived there for 28 years, and for the last seven years, have allowed a few guests like us to spend time at their home, and experience the rustic village life for ourselves. We took the night bus from Bombay to Belgaum, where a cab met us to take us to our destination. The drive from Belgaum to Khanapur is along the highway leading to Goa, and is quite a good road. It is then the surprise starts, with the village road leading into the Western Ghats off Khanapur, and finally the road through the jungle after the forest check post. 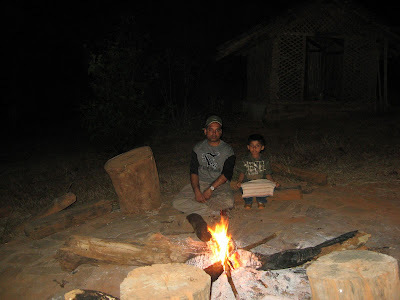 Once we left the main road, we hardly came across any villages or habitations, and realized that for once, we were in the wild, far away from any kind of contact with the masses – a wonderful feeling that intensified once we realized that there was no network, and our cell phones were out of reach!!! I couldn’t help wondering “if this is what it is like, now, what would it have been like 28 years ago, when they first came here?” I felt my admiration for the enterprising couple rising. 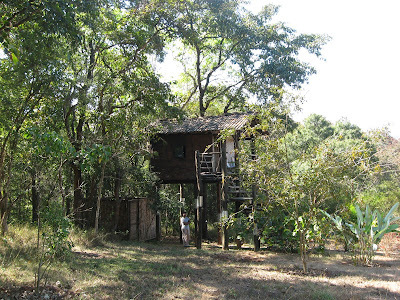 The Hermitage is a homely place, for there are just 3 units available for guests – a Macchan (sort of tree house with a bathroom at ground level), a Kadaba (traditional village house with an open-air bathroom outside) and a Gota (a rural cottage with electricity and attached bathroom). When I spoke to Morvarid to make our reservations, she informed me that kids could be accommodated only in the Gota, so we couldn’t opt for the Macchan as we had intended. On reaching there, however, I understood the reason, and appreciated their insistence on booking only the Gota for a couple with children. It would have been difficult for Samhith to go to the bathroom in the middle of the night, for one thing! The size of the accommodation limits the maximum number of guests at 6-8, with a maximum of 2 kids, if at all and hence it remains rather intimate and homely at all times. We were extra fortunate in having just another couple in the Macchan at the same time, and got to be good friends with them too! 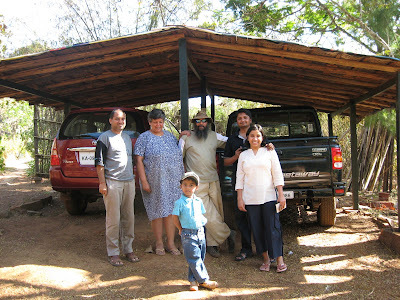 We were welcomed by David and Morvarid with hot tea, followed by a hot breakfast of Poha. Here, I must mention that all meals are cooked by our hostess herself, and though she was hampered by our preference for pure vegetarian food, she served us one wonderful meal after another, which left us licking our fingers. David told us that these were hardly the best displays of her cooking capabilities, and I heartily wish I was more open in my food choices so that I could sample her delicacies. All meals are served in the recreation area, which is beautifully decorated with old brass vessels and antique pieces. 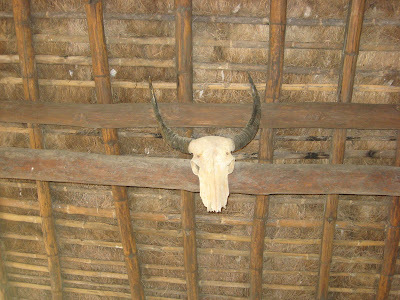 However, what really drew and retained our attention were two skulls of bison. Apparently, a few bison succumbed to some disease a few years back, and their skeletons were later found near this place. These skulls kept Samhith fascinated for all the 3 days. He was really amazed by the sheer size of these skulls. There are a number of activities you can do while at The Hermitage, especially if you are an avid trekker, birdwatcher or swimmer. I am none of these, and with my son, our choices were rather limited, so we opted for a not-too-strenuous trek each day that we were there. 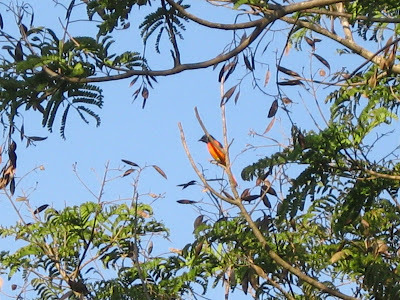 The first day, we went for a nature walk in the jungle around the farm, and spotted a few birds, though no animals. 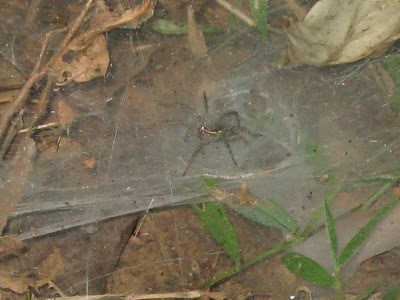 One of the things I was interested in were these spiders which made their webs on the grass, and never between the trees. 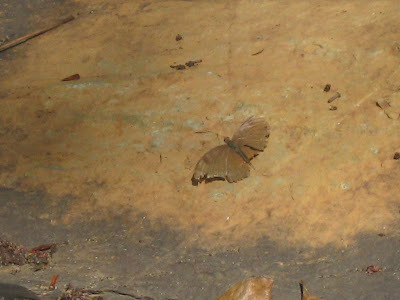 I had noticed this on earlier treks too, and they generally looked as if they had fallen from the trees. 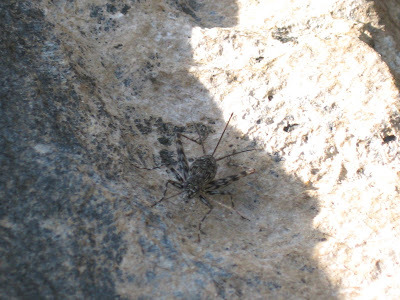 I was informed that these were the so-called tunnel web spiders, which made their webs in a tunnel –like shape and themselves lived in the lowest portion of the web. Bamboo was the most dominant species of plant visible, and it seems that they had flowered just last year. Something we will have to wait another 45 years to see, if we live that long! 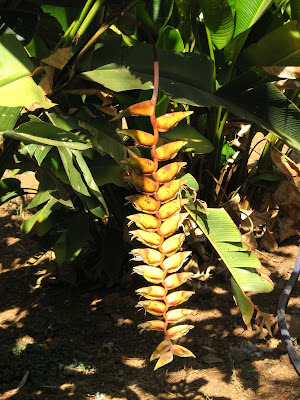 Well, the beautiful flowers were no longer there, but there were vestiges of these flowers on the ground and a few late ones were still green on the plant itself. 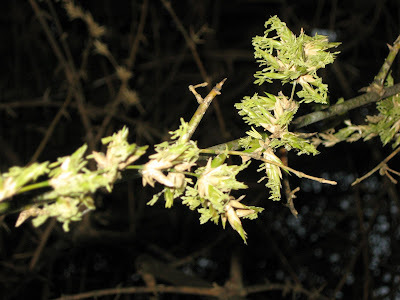 Of course, now that the plant has flowered, the bamboo will die, leaving behind acres of open ground, till the new plants grow to take their place. Wonder what it will be like……..
We returned in time for the lanterns to be lit around the rooms and in the recreation area, and spent some time warming ourselves by the bonfire, getting to know our co-guests better, and then went straight to bed after dinner. Dinner itself was wonderful, the superb food and the witty conversation adding to the intimate ambience created by the light thrown by the many candles around. David and Morvarid manage this whole show themselves, having help in the form of a few helpers from the nearby tribal villages. 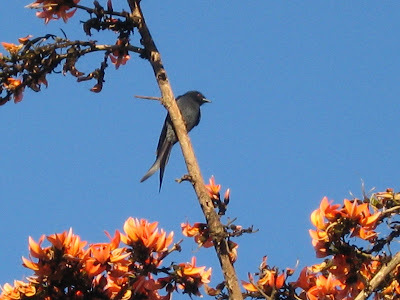 The next morning, I was woken early by the sounds of the birds outside our cottage. It seemed like a sin to stay inside on a morning like this, and besides, Samhith was asleep! 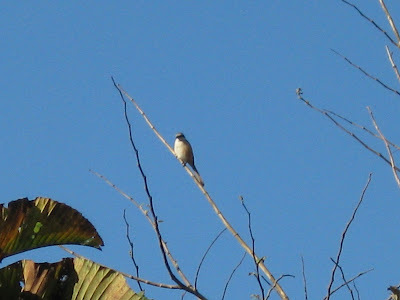 It was the best time to look for a few birds in peace, and wrapping a sweater and scarf (Brrr!!! It was cold!!! ), I went out with my camera. 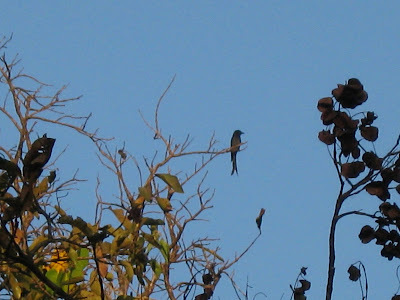 I was successful in capturing a few of the feathered creatures on my camera, but my knowledge of birds is too meager to identify them. 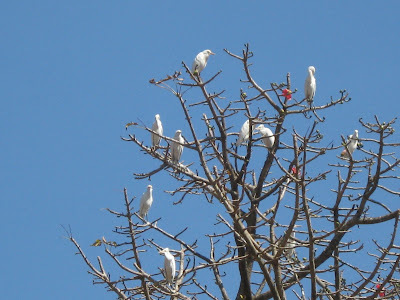 Here are some of them…..
After a hearty breakfast, we went to the Mandovi River for a swim. David drove us most of the way in his jeep, and then we had to walk for a short while before we reached two clear pools made by a small rustic dam, where we could swim without any danger. 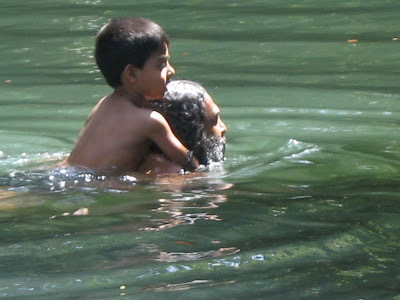 While David was the only one who swam well, Shankar accompanied him into the water, but desisted from venturing into deeper areas. Samhith occupied himself walking in shallow water to collect stones, while I took photographs. Mahesh and Sandhya meanwhile spent their time getting in and out of the water, encouraging Samhith to collect more stones! Samhith was scared to get fully into the water, but seeing some nice stones on the other side, was finally persuaded to enter the water, riding on David’s back. He came back with both hands full of stones, his fear of water totally gone, ready to have a full dip by himself! We walked along the river for a while before getting back to the jeep. 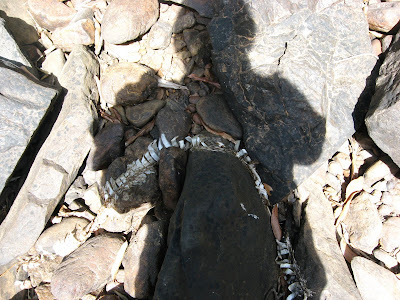 On the way, we came across a snake skin lying on the stones on the river bank. I had half a mind to pick it up, but it was practically stuck on the stone, and I didn’t have time to pride it off carefully without damaging it. I therefore settled with a photograph, after all, it is easier to store a photo rather than a snake skin!!! 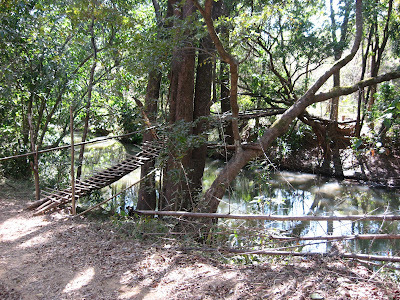 On the way back, we came across this bridge over the river made of thin logs of wood. Fascinating, isn’t it? 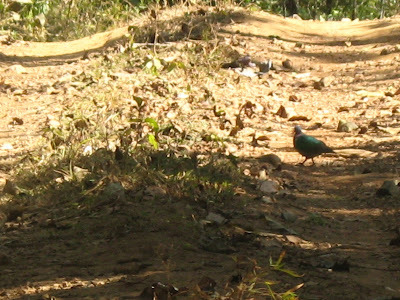 While returning, we also came across an Emerald Dove, walking calmly along the forest path. 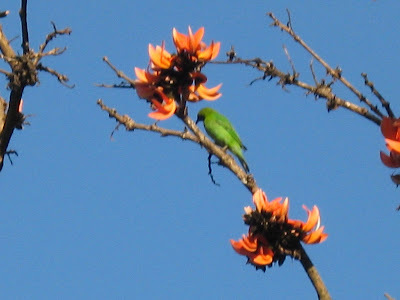 It was so beautiful to see its green feathers (which gives it its name) shining in the sun. 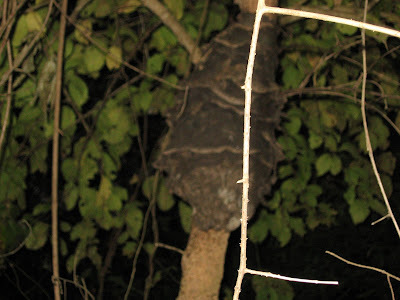 We hesitated to go nearer, afraid that we would scare it away, and I had to try to take photographs through the window. I didn’t manage to do justice to the beautiful bird, but my effort is right here for all of you to see. There are lots of trekking routes in the area – Bear’s hill is a good trek to see the sunset and maybe a couple of bears if we are lucky and the trek to the Pohe Vajara Falls is also a good one. However, these aren’t treks that can be attempted by people like me who are not used to arduous walks, and certainly not for kids. 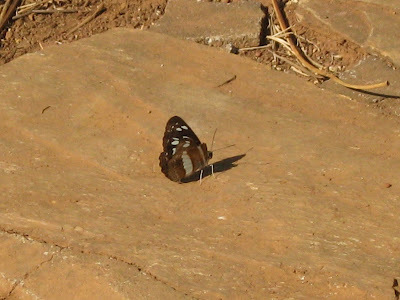 We therefore spent the rest of our time walking around the guest house, looking at birds and butterflies. 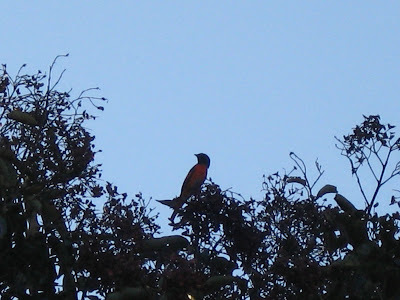 Here are the results of my amateurish attempts at bird watching and butterfly tracking. 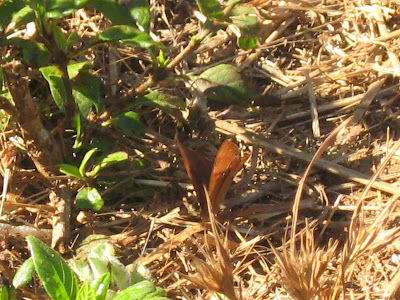 That brown thing is a butterfly!!! 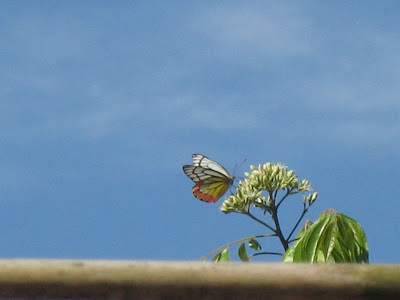 I wasn't able to decide if it was a butterfly or a bee! 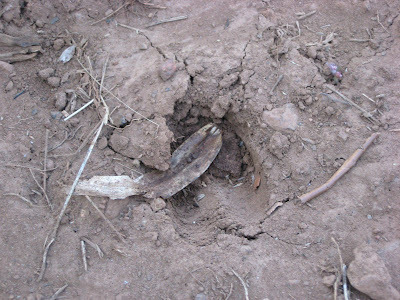 Hoofprint of a Deer- We saw these prints near the plants in the guest house the day we arrived. unluckily or us, the deer didn't pay another visit. Our last day at The Hermitage was to be a relaxed one, for we had to leave in the afternoon. 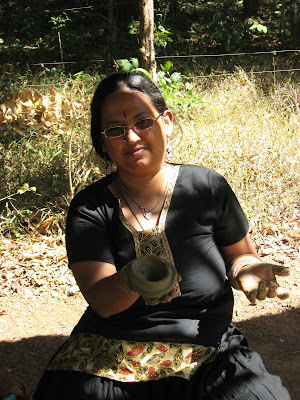 However, thanks to Mahesh and Sandhya, we tried our hand at pottery – there is a potter’s wheel kept in a hut for those who are interested, and a sheet is provided with the basic instructions. If one really wants to learn properly, they can arrange for a potter to come. We were quite happy with our trial and error methods, after all, it was more fun, and in the end, we were able to make something resembling a pot!!! Soon it was time to leave, and we made our way towards Belgaum station to catch our train back to Bombay and the concrete jungle we live in. From left - Shankar, Morvarid, David, Mahesh, Sandhya and Samhith in the front. Belgaum District, Karnataka 591302 India. 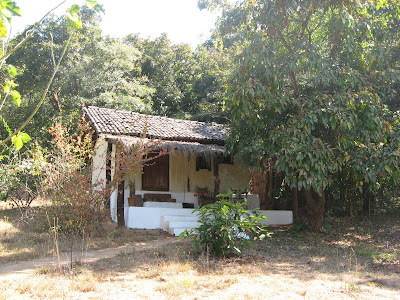 The Hermitage is 45 Kms from Belgaum and 140 Kms from Goa. 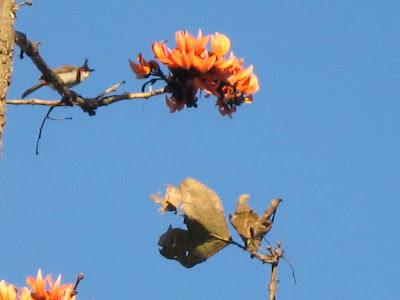 The nearest town is Khanapur, which is 18 Kms from The Hermitage and 28 Kms from Belgaum. Belgaum is well connected by buses and trains, and also has an airport. 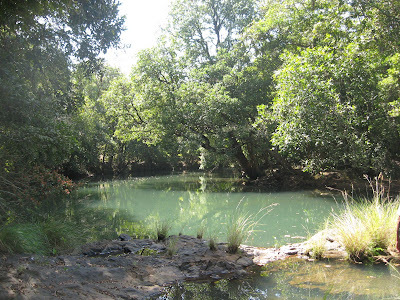 The drive from Belgaum to the hermitage takes about one and a half hours, and since the road is a typical jungle path, it is advisable to use public transport to Belgaum, and ask to be picked up there. Driving one’s own car can be difficult. They do not have a landline, and all communication has to be through cell phones or E-Mail. However, once you manage to make contact with them, they are extremely helpful and prompt. This is not really a place for very small children. Though Samhith did have fun, he couldn’t appreciate many of the finer points, such as the extremely eco-friendly nature of the resort. Another thing is that they appreciate larger animals and are not interested in simple things like birds and butterflies. Moreover, we could hardly try out many of the treks, as he couldn’t possibly walk for long. I am sure he will enjoy the experience once he is a few years older. Hence I would suggest that this is not really the place for kids less than 10 years old. 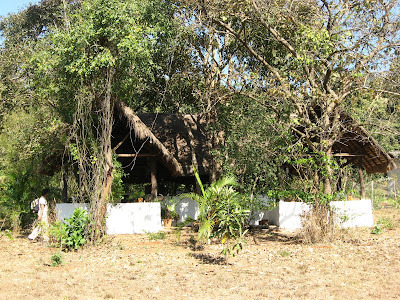 This is just the place for youngsters who would like to try out trekking, and are adventurous. The experience will be wonderful. 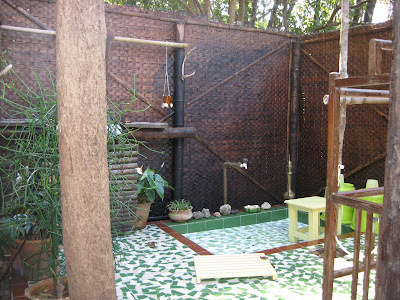 This is also just the place for ardent birdwatchers and nature lovers. 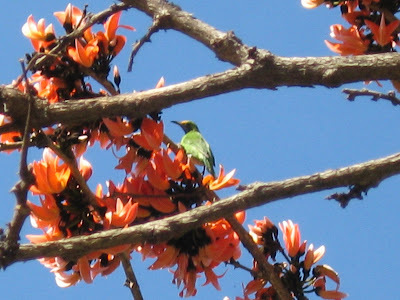 There are a huge number of rare birds, bats and butterflies (over 70 species) which can be seen in the area. So, get your binoculars and cameras ready, and head out for some serious bird spotting! 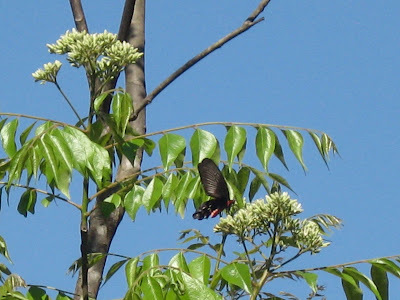 Finally, here is a video I recorded of a bird eating a dragonfly.... a bit macabre maybe, but it was pretty interesting, seeing it for myself..
Anu : This post is very informative and is a welcome post for me since hermitage is in our list of should-visit places. 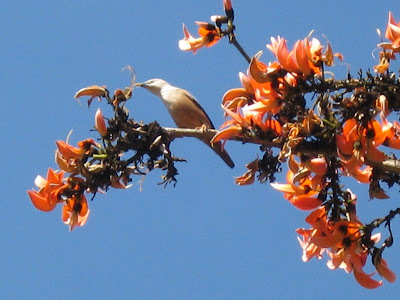 I m amazed at the variety of birds that you have managed to sight here. 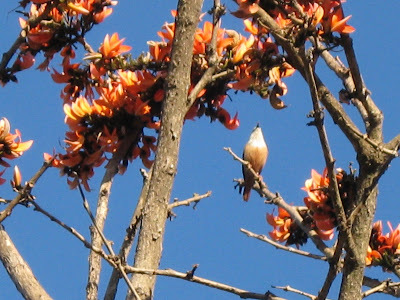 Going by your images you have a drongo, scarlet minivet, emerald dove, chestnut-tailed starling, gold-fronted leafbird, bay-backed shrike, sunbird, bulbul. This surely is a birders paradise. Thankyou ! Thankyou ! Thankyou ! May be visit one day. oh man, I am so there. My American family's recent India visit left them breathless with wonder but also longing for a bit of nature and "off the beaten path" -ness. This sounds like the type of answer we were looking for....thanks again. Hey, thanks for this information. I'd like to visit this place now. Thanks for the post -- sounds very interesting. 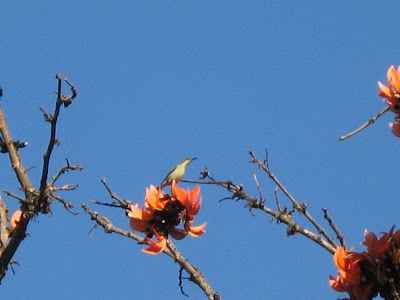 And lovely bird pictures! 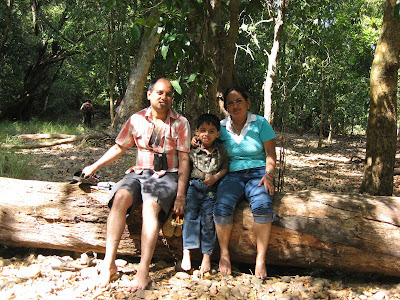 Hi Anu, You have described your visit so well with words and pictures... I am so tempted to make it there. Thnks so much, Anusha!! its such a pleasure to read your comment.... glad to hear that your son loved it too!